This review first appeared as a preview in Inner World Audio where it can be read in its original Finnish version. The writer translated it personally and we feature it here for the benefit of our English-speaking audience. Kari Nevalainen also contributes to 6moons directly and it gives us great pleasure to return the favor and offer samples of his Finnish work to a broader readership - Ed. Here's a pretty accurate description of the Italian Tound T.04: a stand-mounted, 2-way ported speaker with one 28mm dome tweeter and one 131mm mid/woofer. Sounds familiar? As far as I know, there is no global population survey for speakers. If there were, it would be obvious that this speaker type outnumbers any other by a giant margin. The description is accurate but uninformative and misleading. In almost every possible respect, the Tound T.04 deviates from the norm. 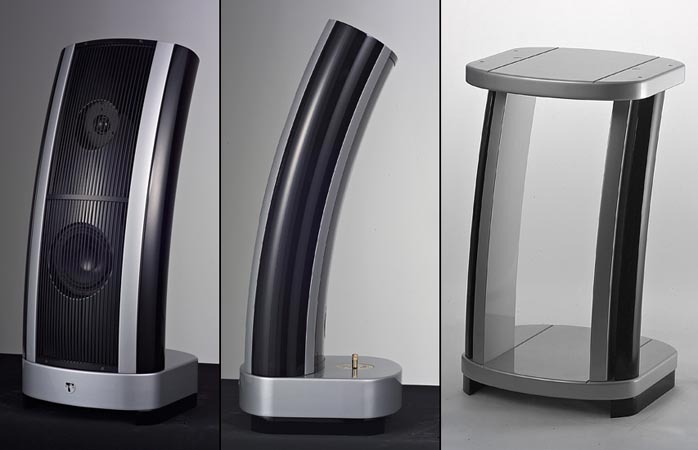 First, for a 2-way speaker meant to be placed on a stand, it's unusually tall at 76cm. When the T.04 sits on its 55cm stand, its total height is over 130cm. 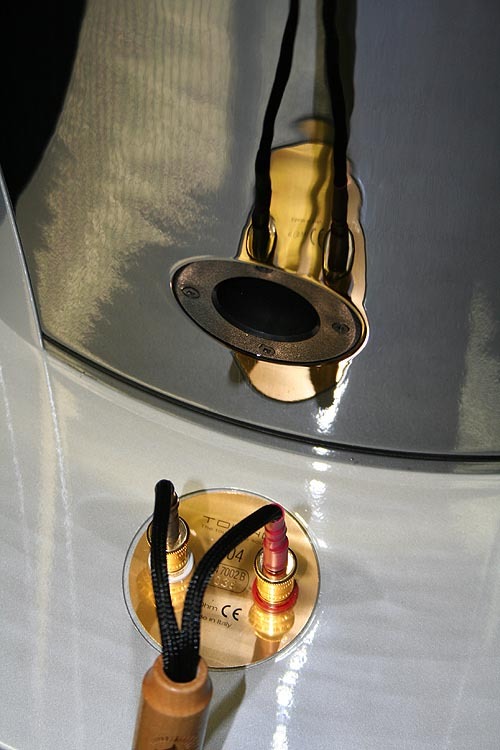 That's more than the mighty Sonus Faber Guarneri on its marble support! Second, its form factor is exceptional. The shallow oval cross-section cabinet arches heavily backwards in a way no other speaker in my recollection does (the sister model T.05 is concave, the T.06 straight). The front and back panels are thick bent MDF, then layered side panels complete the ovoid profile. From the inside, the cabinet looks more like a conventional box speaker even though it's hard to tell how the top ends. Anyway, the internal volume is much smaller than it would be were the speaker oval also inside. The two drivers (custom designs says the manufacturer) operate in the same space. Some sort of foam is placed against the back panel to minimize standing waves and internal resonances. The crossover is hidden in the massive base to which the convex cabinet structure is mounted. Silver wire is used for cabling throughout. Below the base there are four feet in each corner to tighten the speaker to its stand. The grill without which the speaker would not look even half as good is made of steel. It's not damped and rings at a low frequency when plucked with a finger. The stand is made of some synthetic material and fairly light, almost unacceptably light to make the whole structure a bit wobbly. Because of this, the local dealer added extra weight to mass-load make the stand for more solidity. It would be easy to ignore this speaker as just another design exercise. That would be inappropriate because for an obvious fashion speaker, the sound of the T.04 contains too many audiophile qualities. On the other hand, it would not be correct to regard it as a pure audiophile speaker that would have reason to exist even if how it looked were separated from how it performs. The outward appearance of T.04 is part of its essence and cannot be separated from it. In a photo, the T.04 may give the impression of being excessively designed - too marked, too pointed, too demonstrative. It may look like a speaker that seeks peculiarity for its own sake. In the flesh, that's far less so. The T.04 and T.05 look quite good and I'm referring here to a wider sample of opinions than my own. The designer Stefano Sivieri of Prima Linea Studio in Bologna has obviously found his style in these speakers, which extends to all related T.04 accessories. The speaker won't go with cottage-type furniture but it sure fits well with a natural, simple, modern Scandinavian interior. There's something humane in the T.04's constitution, something that reminds me of African sculpture or other objects in Ethnographical Museums. As always, good form and function go hand in hand. The curved shape of the Tound T.04 certainly reduces the amount of diffraction. The multi layered and decoupled side panels plus general construction contribute to the cabinet's rigidity and probably reduce the level of resonances. The receding angle of the front panel enables time alignment of the two drivers and so on. For these reasons -- among others -- the ear first picks a property that is one of the sonic strengths of this speaker, namely how the sound is free from the physical enclosure as though the music were reproduced independently. There's something electrostatic to the sound of T.04 in this regard. This property is very charming and gives the speaker high-end credibility. The Tound T.04 is not, however, a ProAc Tablet 50 or Elac 240. Those speakers too sound open and loose and when properly placed in the room, their boxes can become invisible to the ear. 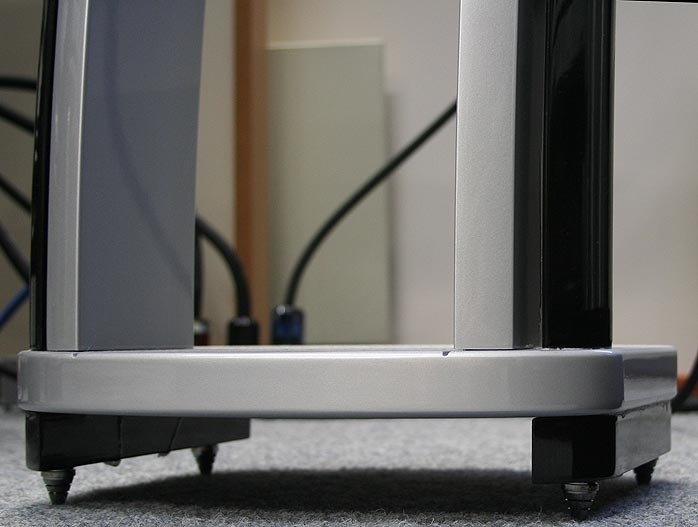 Unlike the Tound T.04 though, ProAc and Elac keep the sound and music in a semi circle well behind the speakers. 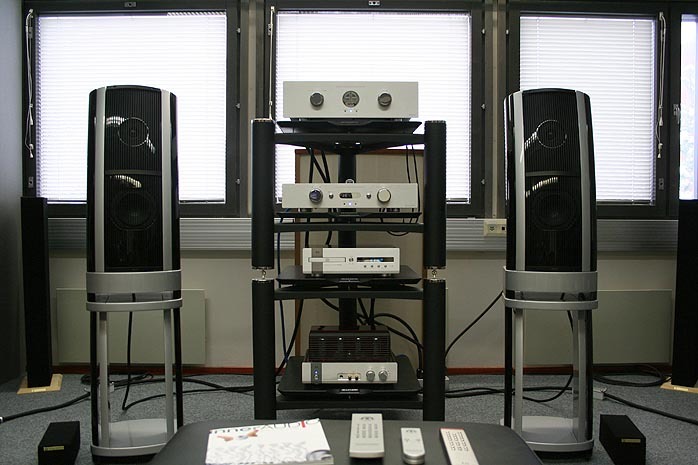 The Tound T.04 is not a soundstage wonder in this sense. The sound's center of gravity or focus is between the speakers from where it emanates forward lively and uninhibited. Personally I had no complaints but that's because I've always liked speakers that with their voice attract rather than distract the listener. But others have other preferences and it's therefore useful to know that these speakers do not behave like mini monitors. The reason why the T.04 does not sound distant and why it occasionally had an inclination to excessive liveliness and indeterminacy is clear to me: relatively speaking, this speaker sounds midrangy. How the tonal balance of this speaker favors the midrange is the main theme in the sonic story of the Tound T.04. All speakers differ with respect to their midrange delineation, the energy balance between 200Hz and 6 to 8kHz - but here we're not talking merely about matters of taste. The choices made with respect to the midrange clearly provide the Tound T.04 with its characteristic sound. But note that the sound is midrangy only relatively speaking. The T.04 is not one of those speakers in which either the lower or upper midrange is purposefully boosted to voice the speaker in a particular way. Instead imagine that you've been listening to a speaker for a while. You've concluded you kind of liked what you heard but also had some reservations. Then it turns out afterwards that you'd forgotten to connect the tweeter cables. Suddenly you began to see what accounted at least partly for your reservations. This is quite plausible. If the crossover frequency is 2200Hz and the crossover is of the first order as Tound says about theirs, then at 4400Hz the response is down only 6dB and so forth. This sort of sound remains quite listenable particularly if it's otherwise in balance. Just recall the old tube radios with their beautiful widebanders which hardly reproduced frequencies above 6000Hz. The T.04 of course doesn't sound like a speaker without a tweeter. While listening to music, it's easy to perceive that the woofer is not the sole source of sound. But that didn't remove my impression that what the tweeter is meant to do in this speaker is not what tweeters are typically meant to do in the majority of hifi speakers. That's how I felt anyway. Does this quality make the Tound T.04 a Rehdeko in design disguise? No, but the T.04 does make a claim that for enjoyable music reproduction, it may not be necessary to reproduce all the highest frequency bands with equal presence. In this it resembles Rehdeko but the way in which it makes the statement is more subtle than the Rehdekos I've heard. The relative absence of the high frequencies makes the T.04 somewhat muffled and subdued. The sound is not thick or unduly warm and dull though. The midrange is still clean and coherent. But the sound is on the far side of bright and that has consequences for good and bad. First I thought that the culprit was the tweeter being clearly above ear level but even if that explains a bit, it's not the whole story. The tonal balance does not change substantially if the speaker is listened to standing nor does it change -- get darker -- if someone is walking past the speaker as normally happens when the tweeter's output is shaded for some reason. It seems the T.04 is not very directional at the high frequencies. How does the T.04 do with music? Some audiophiles pointing to the speaker's soft tonal balance would no doubt say it's not how a hifi speaker should present the music. Apart from other things they would refer to some sort of midrange compression with certain vocal music, for instance. More and finer highs would enable the music to breathe better and render the sound more relaxed and sophisticated. But life is rarely that simple. During the days and weeks I spent with this speaker, I became quite confident that how the T.04 sounds is more or less exactly how the designer wanted it to sound. So we need to ask why?